As part of the BMA's 'African Spirit Series,' the Shriver Hall Concert Series presents Imani Winds in a performance titled 'How Jeff Got His Groove Back.' In this 'music-telling' theater piece, young audiences are taken on a musical and theatrical adventure as the courageous Jeff realizes his groove was with him all along. The event is free, but tickets are required. Call 410-516-7164 or stop by this website. See Music. Tues., Nov. 28, 4:30 p.m. "Ambiguity Theory, Old and New"; 308 Krieger. Wed., Nov. 29, 4:30 p.m. "Periods and Motives, Part I"; 302 Krieger. Thurs., Nov. 30, 3 p.m. "Periods and Motives, Part II"; 302 Krieger. Wed., Nov. 29, 4 p.m. "Our Changing Atmosphere." Thurs., Nov. 30, 11 a.m. "Aerosols and Climate." Sat., Dec. 2, 2 p.m. 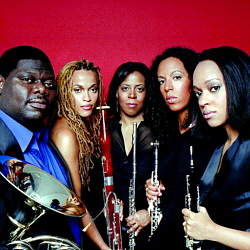 The Shriver Hall Concert Series presents a family concert by African-American/Latino wind quintet Imani Winds, the 2006-2007 resident artists. Auditorium, Baltimore Museum of Art.